One of my favorite areas to walk the dog is in the Haynes Manor neighborhood of Atlanta, and as I walk I often wonder what the homes look like on the inside. Thanks to the wonder of online real estate listings, I sometimes get to have a peek into some of my favorite homes. Such was the case recently when I saw a sign on the yard of a home I have long admired. 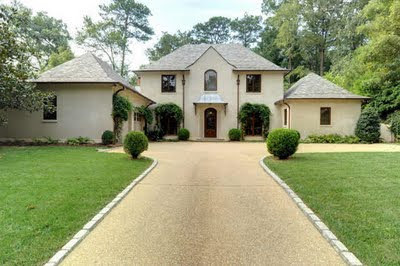 The architect of the home is Keith Summerour, one of Atlanta's most well respected names in architecture. As soon as I saw the pictures in the listing, I knew that great care had been taken in both the architectural and interior design of the home. I am not sure how this architectural style would be described, but the overall result is beautiful, classic, and streamlined, with a distinct European flair. 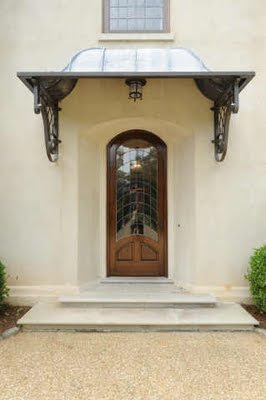 The entry and its metal overhang (there must be a name for this) are the focal point of the front fascade of the house. 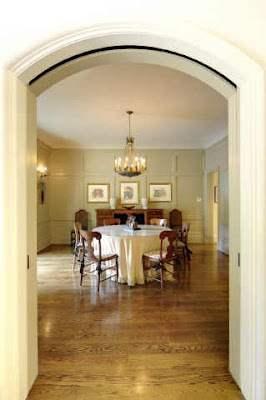 In the entry, on the left is the dining room, through an arched doorway. The real estate listing includes a picture of the dining room table all set for entertaining. White tulips - my favorite! One of my favorite rooms in this house is the music room/library. This picture is taken with a wide angle lens, which works well for real estate photos because it enables more of the room to be seen. I like how the door is off center to allow for room for the piano. Sometimes it makes more sense not to have a door centered on a wall. This picture of the room probably gives a better idea of the true size of the room (the previous picture was probably taken with a special lens in order to get a full view of the space). 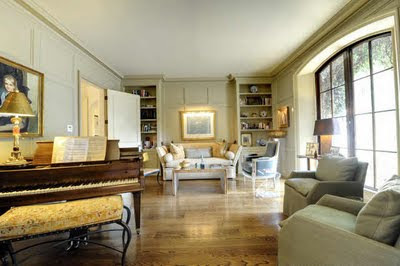 I really love the arrangement in this room; there is a grand piano, but also a seating area and bookshelves. All of the walls, molding, and built-ins are painted out in taupe, with a contrasting black trim on the windows, which gives the space a cohesive and cozy feel. The foyer can be seen from this angle, and it opens into a stair hall. Great sconces on either side of the opening. The stair hall opens to the living room. I love houses that have a living room that can be seen when looking to the back of the house from the front door. 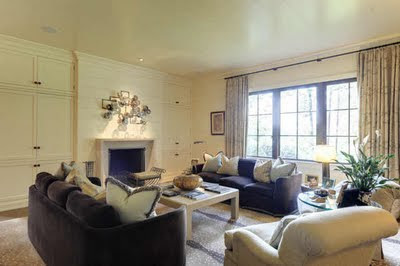 A backless settee is effective in this space, as it provides seating, but does not block the view of the fireplace. I am unclear what the living room opens to on the left; I suspect it is a wall (with the kitchen on the other side), and the family room on the right. Some architects do not like for the living room to have any kind of view into the kitchen. A view of the living room from the side; I assume that the hall to the right goes to the master bedroom. The doors on either side of the fireplace open to the loggia, which also has a fireplace. 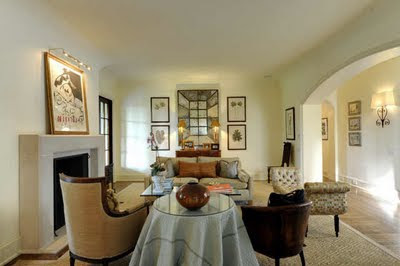 The family room is a nice space, and on the right (not seen) opens to the loggia which is behind the living room. This picture shows how the family room and the kitchen are open to each other, yet separate. I am very curious what is behind the wall on the left - the one with the vertically oriented piece of art. Perhaps it is kitchen storage or the kitchen pantry. Here is a good view of the kitchen and the casual dining space, which are in one big room and seem to have a well thought out design. I really like the painted black trim that is consistent in the public rooms of this house, and it is particularly striking in this kitchen that is predominantly white. I wonder what is inside that corner door to left of the windows? Perhaps it is the pantry. If this is the case, I suspect that the appliances are against the wall on the left, not seen, because I do not see a refrigerator. The master bedroom is a great space, done in a rich chocolate palate with a touch of robin's egg blue in the window treatments. A view of the loggia off the family room and living room. This space feels like a real room with its beautiful rug and clock above the fireplace. The loggia opens to the back yard, which has a pretty creek view. I hope you enjoyed this tour! This is one of those homes that I immediately felt as if I could very happily live with its floorplan, a sense I often get when I see homes designed by Keith Summerour. 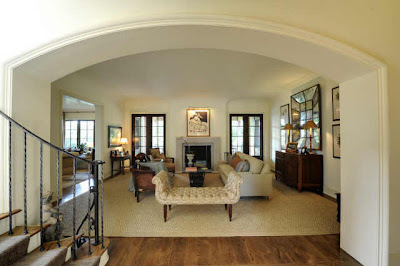 His architectural style has great European flair, with flowing floorplans that really make sense for 21st century life. For more information on this home, please see the real estate listing, by Harry Norman Realtors. For more information on the architect, please see the Summerour and Associates website. If you have been in this home, please email me and let me know what you see through the opening in the living room, and where the fridge is located! All images are via the real estate listing. That view into the dining-room is to die for. So much to love here. Beautiful home - thanks for finding and sharing. That dining table is too small for that dining room, isn't it? Your table in your own home would fit nicely. There are very few homes on the market that I feel like I could move into - I am very particular and have a strong sense of what I want - but this is a home that I really, really relate to. I have another home in mind, though, so I will not be pursuing this one! 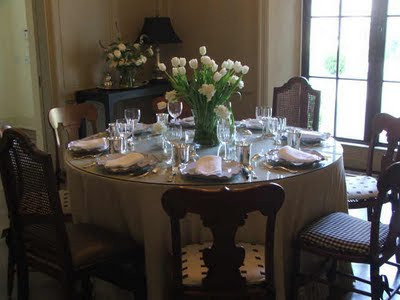 I have a feeling that the table fits the dining room better than you would think - look at the decorated table picture, the table looks like it is a good size for the room. Perhaps the view into the arched opening was with a special lens that made the room look bigger than it is (just as that lens was used with one of the library/music room pictures, and it looked way bigger in one of the shots than the other shot. I love it all. I could so live here. Thanks for posting. Wonder what the price tag is. Wonderful and warm. 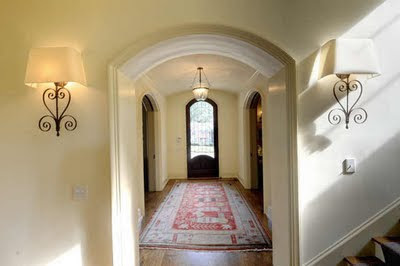 The arched doorways are wonderful. 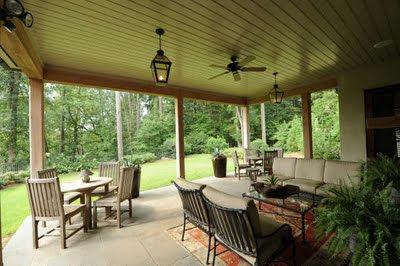 I love the outdoor loggia. 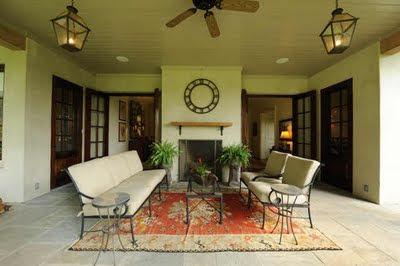 I just love the way they put rugs in the alfresco area, I think I will be doing that in my new home too! 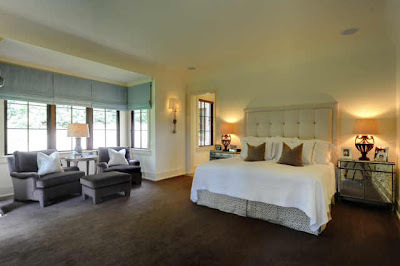 And that master bedroom is divine! hmm -some sort of 'modern english' or 'updated english'...i don't know what the style is! beautiful home though, even though I hate the very visible garages.....I guess a garage court like this isn't so bad though. He always puts such lovely detail into his houses. Like that metal thingamajig over the front door. You're right, there must be a name for this! Me too. I love Keith Summerour's work. Understated grand simplicity? One of the few architect names in Atlanta I've bothered to discover. Thanks for posting so many pics. Good grief, this one really has the arches. The staging takes some of the life out of the place: more tulips everywhere please. I don't know what to make of the front elevation. It has so much that I like right down the minimal low-rise foundation plantings. The crook in the roofline, the amazing awning, the flair to the gable, minimal steps to the front door. There is alot of design and craftsmanship. I want somebody to move in an liven it up with a little human disorder and color. Thank you for sharing these images! It is a beautiful house! Amazing house! He is such a talented designer. Keith is a genius. I'm so glad I was introduced to his work when I was with Beth Webb. i think this is a beautiful place. what wonderfully soft lines were applied to the architecture and the furnishings!! The house is gorgeous and the layout looks very well thought out. My only complaint is that I think the decor could really be bumped up a notch. But then again, the house is for sale and a "blank canvas" is how they want it to show. not being a fan of newer homes............this however has the details often missing in new construction. am crazy for the molding/panels in the living room, lending great texture. Great tour. Love the upholstered bench in the living room. Sounds like your house search may be going well. Love this house. Isn't it great when you get a peek into homes you have always wanted to see? I will take the loggia!!! As we say in Texas... Yeyus! I love the entrance canopy! Although, it's all a bit too beige for me. Hi! I enjoy your blog so much, and I wanted to pass the Kreativ Blogger award on to you! That is a beautiful property - Love the light in the space! This really is a beautiful home....I like the base neutral palate, but would love to see some more color in the accents here and there. I too, like the Music Room with the library at one end. I envy you with all the eye candy you get on your walks, your dog is a lucky pup! Wow you always find the best listings to show! Great kitchen and i agree the black trim is striking! 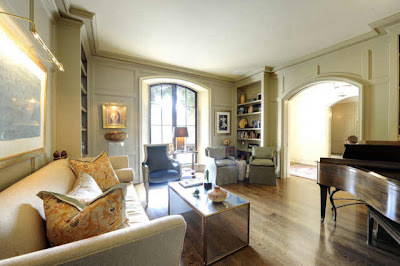 I sure am inspired, I have a love of beautiful homes as well, the pictures are beautiful and really capture the feeling of the rooms..Love your blog and I am now a follower of yours, come visit.. This is a fabulous view! I love that neighborhood as well- though honestly the loggias are often my favorite areas. :-) This is very calming and somehow still largely approachable- though wouldn't mind seeing a little more color in some of the rooms. Regarding the potential pantry door- I hope so, but also hope that there is a butler pantry as well. Seems that it would fit right in. *swoon* That loggia took my breath away. What a beautiful home. I love your blogs for a Million reasons....but the one I have to say at the top of my list is the INSPIRATION !!!! Thank You !! !